I went behind the wall, guys! I saw the new Frozen area in Epcot and it’s looking pretty fantastic! The ride wasn’t quite ready for me to experience, but I did get a good look at the new buildings and the Royal Sommerhus. The kids are going to go WILD when they finally have access to Frozen Ever After!!! Frozen Ever After is due to open this JUNE. The expansion takes place behind the Norway you know and actually didn’t remove anything that guests currently love about the world. They knocked down crew buildings and storage units to make room for this new area which is so great because that means it’s a true expansion to the Norway Pavilion. When you first walk in, you will be greeted with a large area for stroller parking right in the center of the town. Behind the stroller parking and to the left, there will be a cabin that will be filled with artifacts from Anna and Elsa’s childhood. It’s their childhood home! Children will be able to walk through and see all the wonderful memories that the girls had before we met them in Frozen. These pictures and objects are all from the “good times”… before the castle shut their doors to the rest of the world. I know Frozen fans will really appreciate this view. Once you finish in this area, you can head into the Wandering Reindeer, which is a merchandise shop that was actually modeled after a building in Norway. The team truly did bring Norwegian architecture home to Florida. They took several trips overseas to make sure they got it all right. I love this!! Looking for a meet and greet? You are in LUCK! The Royal Reception Hall will house Anna and Elsa all year long. The Royal Sommerhus was also inspired by an actual cabin in Norway. Something to remember as you walk through. And then of course… you have THE RIDE. 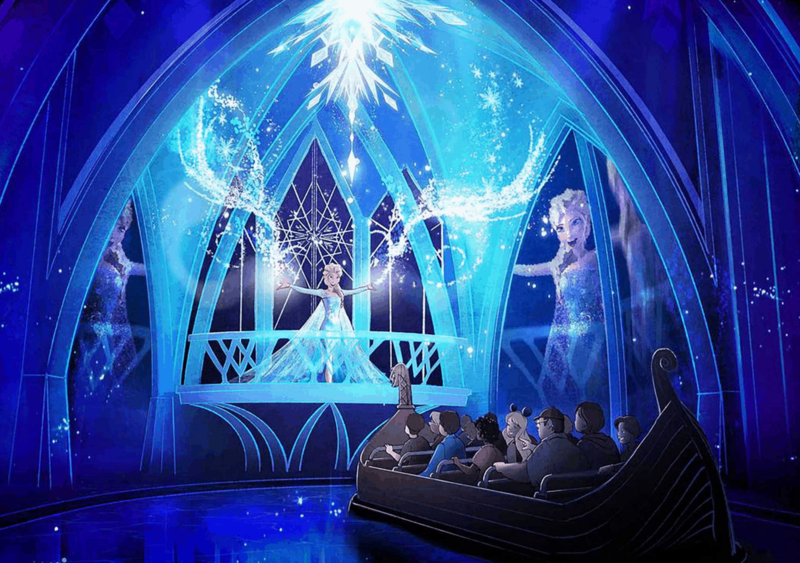 Frozen Ever After will be a boat journey that will take you up to the Northern Mountain and through the Winter and Summer Celebrations. The original cast lent their voices to the ride – so look out for that. YES – your favorite songs are all there BUT WITH A TWIST!!! I don’t know what that means yet. I’m sure they use different words at some point, but I’m not sure how. Remember during the old Norway ride, when there was that little dip down and it felt like you were going to go down on a rollercoaster ride but it stopped midway? Apparently, that’s still in play. They tweaked it a bit though. It’s absolutely not the same ride, but it will have the same feel. That’s what I was told. One more thing –> this ride is for all ages. We asked if we could compare this ride to “It’s a Small World” or something scarier and the team said it’s “one of a kind” but it’s for everyone. So, come on – come all! It’s snowing in the summer and we are all invited!!! *Disney invited me to the press preview. All opinions are my own.